The Rosetta spacecraft has spent three years peering at Comet 67P/Churyumov–Gerasimenko from orbit—but this week, its watch will end. Tomorrow, Rosetta begins a controlled descent to its final resting place on the edge of an enormous pit, where it’ll remain frozen until the space rock itself is destroyed, or until the universe expands into oblivion. It’s an emotional time for the Rosetta mission team, but also an exciting one. The final hours of Rosetta’s life are expected to yield some of the juiciest scientific data of the entire mission—the sharpest images yet of a comet’s surface, our very first whiffs of the gas directly above it, and much more. Best of all, the entire world is going to be able to follow along, with key moments of the descent, including images, streamed online in real time. The Rosetta team will spend tomorrow morning stirring up hype for their spacecraft’s dramatic finale, with three hours of science talks highlighting everything we’ve learned about Comet 67P. The talks begin at 8:30 am EDT (5:30 am PDT)—a perfect excuse to impress your boss by getting into the office early. Gizmodo will also be hosting a live Q&A with Rosetta mission scientist Paul Weissman, beginning at 2 pm EDT (11 am PDT). I, for one, will be asking whether comets do indeed smell like cat piss. In the early hours of the descent, Rosetta’s navigational camera will play a critical role, by snapping a series of photographs that the mission’s flight team will use to determine how fast the spacecraft is traveling and when it’ll land. Any brave souls who are both awake and excited about science at 4 am EDT (1 am PDT) will be able to find out exactly what time touchdown is scheduled to occur—plus or minus two minutes—with regular updates issued on Twitter @ESA_Rosetta and @esaoperations, and on the Rosetta blog. A brief webcast, available at https://livestream.com/ESA/rosettagra…, on the ESA’s Facebook page, and at rosetta.esa.int, will confirm the touchdown schedule. If you are awake at that time, you’ll also want to head over to the ESA’s Rosetta image archive and Rosetta’s social media channels for new photos from the descent, which should begin to trickle in very early on September 30th. From these images, mission scientists will also figure out where Rosetta is going to land. It’s expected to touch down on the comet’s head, in between several large pits in a region dubbed Ma’at, after the Egyptian goddess of harmony and order. But that could change: if Rosetta veers slightly off course, it might actually enter a pit, a possibility that Rosetta mission scientist Laurence O’Rourke calls “quite exciting. I think it’d be a spectacular set of pictures,” he told Gizmodo. That low throughput—45.76 kilobits per second, slower than your average dial-up connection in the ‘90s—will make Rosetta’s final hours extremely intense for mission operators, who’ll be scrambling to downlink as much data as possible. All but three of Rosetta’s science instruments will be operating until the very end, with the final scraps of data expected to be collected between 20 and five meters above the comet’s surface. The OSIRIS instrument’s narrow and wide-angle cameras will be snapping photos of the Ma’at pits. The ROSINA instrument will collect data on the composition of gas directly surrounding the comet—something that’s never been sampled before—and determine how quickly ice is sublimating off the surface. Other instruments will probe surface temperatures, dust densities, and the strength of the solar wind. “We’re literally diving into the unknown, entering a new zone for science,” O’Rourke said. The impact itself is expected to occur around 6:40 am EDT (3:40 am PDT), give or take twenty minutes. Live streaming will start ten minutes prior to impact, so plan to watch around 6:30 am EDT (3:30 am PDT)—unless NAVCAM throws us a big surprise. Once again, you’ll have several streaming and options. In recent years, we’ve grown accustomed to space agencies live-streaming exciting mission achievements, so that the world can celebrate alongside the scientists. But unlike the New Horizons Pluto flyby last summer or Juno’s arrival at Jupiter a few months back, this milestone comes with a touch of sorrow: Rosetta is ending. The ESA isn’t waiting to receive a triumphant victory signal from its spacecraft. It’s waiting for the phone line to go dead. “In a way, we’re just waiting for silence, and that is weird,” Taylor said. Due to the signal travel delay, Rosetta’s death will be confirmed roughly 40 minutes after touchdown. The ESA is expected to continue live-streaming for about 20 minutes after a loss of signal has been confirmed, during which time we should get to see the very last images the spacecraft took before impact. You might be wondering why the European Space Agency chose to give its prize comet orbiter a firm expiration date of September 30th, 2016. The reality is that the ESA is prolonging the mission as long as it possibly can. Every day, as Comet 67P speeds further away from the sun, Rosetta’s solar panels are collecting less and less power. By early November, the spacecraft would be running on fumes. Even before Rosetta freezes to death in the void, a solar conjunction in October—in which the sun falls between Earth and the spacecraft—could cause communication problems. “September was the perfect time to finish on our terms,” O’Rourke said. For the mission team, however, Rosetta is far from over. Once the spacecraft falls silent, scientists can finally analyze all of the data they’ve collected over the past months and years. Already, that data has yielded insights into the surprisingly active lives of comets, their mysterious interiors, and their connection to our own cosmic origins. Expect to keep hearing about what Rosetta has taught us for years to come. September 29th, 8:30 am - 12:30 am: The ESA will be live-streaming a series of talks by Rosetta scientists, highlighting some of the key things we’ve learned from the spacecraft’s three years in orbit around Comet 67P. September 29th, 4:50 pm: Rosetta executes its final collision maneuver. The descent begins! September 30th, 3:55 am -4:05 am: Final maneuvering commands based on NAVCAM data will be issued. A brief livestream will confirm the exact time Rosetta will be touching down on the comet. September 30th, 6:30 am - 7:40 am: Livestream of Rosetta’s last moments, featuring updates on the status of the spacecraft, a confirmation of its death, and real-time images. 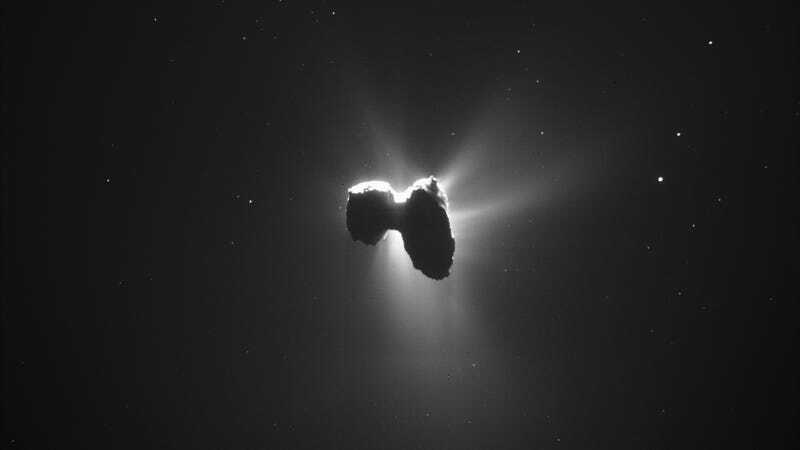 If you want to say you watched a spacecraft crash into a comet, THIS IS WHAT YOU WATCH.